This DVD set of Sonic Underground that I just watched is pretty much my first experience with the series. Although I glued myself to the stupid Nintendo cartoons that came out in the late 80s and early 90s, by the time Sega actually started releasing Sonic cartoons, I was way over wasting my time on lame entertainment. And Sonic Underground came out in 1999, when I was finishing my last semester of college and heading into the career part of my life, so needless to say I really didn't pay a bit of attention to it. But now I'm in that part of my life where I can take time to look back and check out past series. Some turn out to be as good as I remember, though most do not. So, how does this show stack up? Sonic Underground isn't bad, or at least not nearly as bad as I was expecting. I was fully prepared for Super Mario Bros style show with boring characters, extremely weak stories, and lame conflicts, but what I actually got was a pretty average cartoon. It wasn't great by any stretch of the imagination, but it was watchable. Each episode contains a song performed by Sonic and his siblings (yeah, they are in a band), and these can get kind of annoying, but writing a new song for every episode has got to be a tough job so it's hard to blame anyone for that. The show focuses on Sonic the Hedgehog, his brother Manic, and his sister Sonia. All three characters are voiced by Jaleel White (that Urkel character on Family Matters), and this is pretty obvious, especially with Sonia. The story finds the three born to a queen, but separated at birth so the evil Dr. Eggman wouldn't find them. Some prophesy was given, and when they became teenagers they were all magically drawn to each other... to form a band. Thankfully, each of them had learned to play an instrument. Otherwise that would have been a really awkward band. Also thankfully, they each learned a different instrument, because a band full of three drummer would also have been quite awkward. So, with Sonic on guitar, Manic on drums, and Sonia on keyboards, the three find a chance each episode to crank out a song. Sometimes it helps with a problem, and sometimes it's just for fun. Oh, and I forgot to mention Dr. Eggman, who has taken over the entire city. Once the trio came together, Dr. Eggman, becomes aware of them and pulls out all the stops to capture them. And what I mean by "all the stops" is that he sets his dumbest (and seemingly only) henchmen to capture them. So Sonic and family spend their days avoiding these creeps while searching for their mother and trying to put a hurt on Dr. Eggman via the underground resistance (hence the title of the series... see, it's all coming together). There's nothing really deep here, but it's a decent enough cartoon for children and not to terribly annoying for adults. The 3-disc DVD box set has extra features like a CD soundtrack featuring 8 of Sonic Undergoround's greatest hits, an interview with the executive produced titled Developing the Underground , and a behind-the-scenes that deals with the music of the series. There's also concept art and boring stuff like that. Sonic Underground was released by Shout! Factory on DVD starting December 18, 2007. The heroic hedgehog is back! As told in an ancient prophecy, Sonic is reunited with his two siblings, Sonia and Manic, to form a band – Sonic Underground – using their electric guitar, keyboard, and drumset (which seamlessly transform into weapons during battle) to fight the evil Dr. Robotnik, all while searching for their mother, Queen Aleena Hedgehog. But there’s still one more problem: the queen doesn’t want to meet her children at the wrong time, thus altering the fate of her family – but only when the prophecy is fulfilled can the planet Mobius return to a world of peace and harmony! Sonic Underground is the third animated series based on the popular Sega video game character, featuring Family Matters’ Jaleel White as the voice of Sonic and Sean Connery as the voice of Great-Grandfather Athair. Each of the 40 episodes in the series also featured a Sonic Underground song in music video form. Rock on with Prince Sonic, Princess Sonia, and Prince Manic as they travel to planet Mobodoon, elude captivity by the robotic hands of bounty hunters Sleet and Dingo, and battle ART – Dr. Robotnik’s most horrible henchman yet! 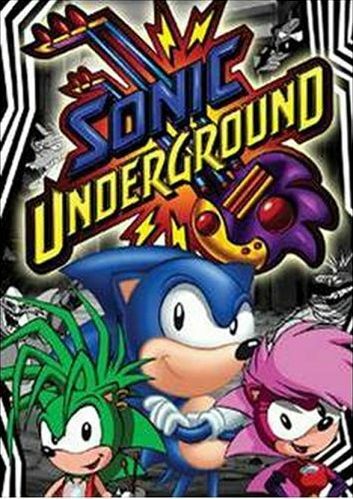 Sonic Underground: Volume 1 will be available for the first time in a 3-DVD set on December 18, 2007 for $34.99 SRP. CD Soundtrack featuring 8 of Sonic Underground’s Greatest Hits!